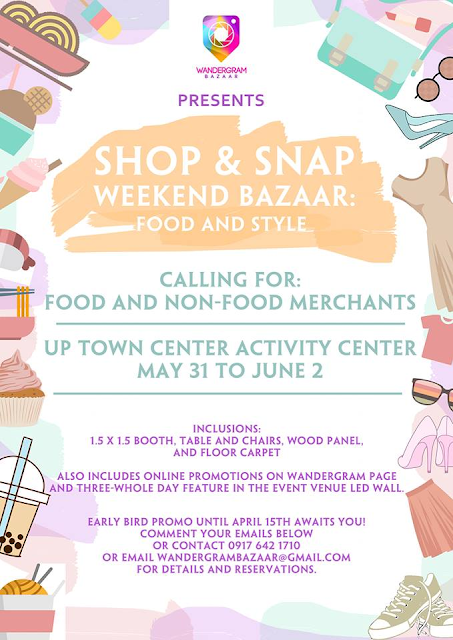 Wandergram Bazaar is looking for Food and Non-food Merchants for its May 31 to June 2 Payday Weekend Bazaar in UP Town Center Activity Center! The theme for this bazaar is, "Shop & Snap," where shoppers can both shop and take a snap/picture on the pastel-themed bazaar design. Comment your emails below for the application form, rates, and guidelines. You can also contact directly at 09176421710 or email us at wandergrambazaar@gmail.com.